Horstead is the southern suburb of the larger and more interesting village of Coltishall, although I'm sure that someone will e-mail me and try to convince me otherwise. Horstead is where the traffic from the south and west funnels together to be disgorged into Coltishall's shopping street. But a gentler form of traffic can be found here too, because the lovely River Bure flows through into the Broads, and this makes Coltishall and Horstead a popular area with visitors, and a popular place to live, being handily placed for Norwich. All Saints is set back from the main road behind the village hall. While St John the Baptist at Coltishall, half a mile or so away, can appear rather stark, All Saints is a a very pretty little church, its three red roofs of different heights huddling like a medieval town beneath the chimney-like tower. The reticulated tracery of the two east windows lends it an elegance, and it is set in an attractive graveyard. This is all a rather clever sleight of hand, because apart from the 14th century tower, this is the work of Diocesan Architect Richard Phipson, in 1879. It is worth noting that this is at the time he was working on his masterpiece, St Mary le Tower in Ipswich, and there are perhaps slight echoes of that great urban church in the attention to detail, and the way the roofs are used to create a visual effect of a cluster of buildings. 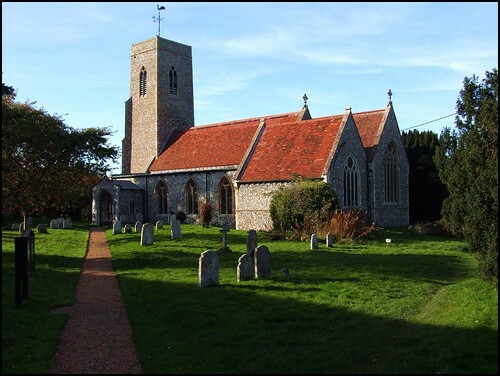 For many many years, Horstead and Coltishall stood out as just about the only inaccessible churches in the whole of the Norfolk Broads.Today, Coltishall is open, and Horstead lists three keyholders, which is splendid news. I must be honest, and perhaps even a little harsh, and say that I can see no reason for this church to be kept locked. It is well-protected by neighbours, and would provide a spiritual heart to a place that is not among Norfolk's more characterful villages. Above all else, the great treasures of Horstead church are not the kind of things that can be carted off in the back of a white transit van, because All Saints has one of the finest collections of late 19th and early 20th Century glass in north-east Norfolk. The most famous is the south nave window designed by Edward Burne-Jones for the William Morris workshop. It depicts Courage and Humility, two of the favourite late Victorian virtues, and two which we could do with a bit more of in public life today. Courage appears as a St Michael-like character, his shield slammed by crossbow bolts. Humility is feminie, with echoes of St Mary Magdalene, a favourite subject of Burne-Jones. As if this were not enough, All Saints is also home to what must surely be the best Kempe window in East Anglia. It fills the east window; Kempe is not always good on a large scale, but in this case the workshop got it exactly right. The window depicts two local figures, neither of them actually canonised: Herbert de Losinga holds the Cathedral which he founded at Norwich, while the mystic Julian of Norwich stands with the church in which she was an anchoress. Between them are the blessed virgin and St Nicholas. Female figures in Kempe windows are not always successful: too often, the workshop depicted them as rather matronly. But the Blessed Virgin here is shown as young and triumphant, and even Dame Julian wears her wisdom lightly. To the south of this, in what must always have been the vestry and organ chamber, there is a magnificent and unusual window by the Hardman workshop, depicting the ancestry of Christ in the form of a Jesse window. There is more glass in the nave, including a depiction of Christ summoning the disciples, which I think must also be by Hardman. Rather less good is the Good Shepherd and St John, possibly by Ward & Hughes, and another successful Kempe window at the west end of the south aisle depicting St George and St Cecilia, although with Cecilia the workshop's familiar female matronliness kicks in at last. Pevsner makes an interesting point about the rebuilding. The reported cost was a mere £1,178, roughly £200,000 in today's money, which does not seem anywhere near enough. There are plenty of surviving features from the earlier church, including the south doorway and the font: is it possible that Phipson merely built the south aisle and arcade, and refaced the other walls? The excellent glass gives the church a spirit which might be lacking in what is otherwise a fairly anonymous rebuilding. However, there is a real atmosphere and sense of Horstead in years gone by from the way it is furnished, decorated and cared for. A memorial to former members of the choir is unusual and lovely, and I also liked the little crucifix in the vestry beside a surviving brass inscription from the early 17th Century. And there are two mighty 18th century memorials in the nave, a reminder of quite how prosperous Coltishall and Horstead were in that century. Best of all, there are two WWI survivals worth noting. The inscription on the memorial to Corporal H E Northgate, who died at Gaza in 1917, places the name by which he was more commonly known in brackets, after the formality of his rank and family name. It is as much as if to say you know, our boy Percy! - a movingly intimate moment. Another memory is set into the splay of the vestry window, and you might easily miss it. The families of the boys who did not survive the War were awarded a large and rather tacky bronze medallion depicting Britannia exhorting a lion to go into battle. Most of these ended up in bottom drawers, until brought again into the light of day years later by house clearances. There are always one or two of them on ebay. Drury Frank Percy Wormald did come back from France, but he died on the 4th November 1918, the week before the Armistice. He is buried at Clive in Shropshire. Rather than hide the pain of that memory away, his family made it public by donating the medal to this church for display, and you can still see it today.